The Peng You Taiji Quan Association is a not-for-profit organization. Our commitment is to create a “healthy, friendly and happy” life style through the practice of Taijiquan. Now located at the Peng You International Academy at the Boys & Girls Club, 270 Windsor St., we began informally at the Thunder Bay 55 Plus Centre, Thunder Bay, Ontario, Canada, as a Tai Chi Club within the centre. In 1998, the Peng You Taiji Quan Association was formed as a result of the increasing demand for Taiji Classes for people under the age of 55, too young to join the Thunder Bay 55 Plus Centre. The business of the Association is managed by its Board of Directors and the teaching program is led by the Association’s founder, Master Peng Youlian. Grand Master Wang Jianhua has guided us since our beginning. Master Zeng Nailiang is our Chief Advisor. Master Wei Xianglian is our Honourary President. We are members of the Confederation of Canadian Wushu Organizations, the Canadian Organization of Traditional Taiji Quan Associations, and the Thunder Bay Martial Arts Council. The Taiji classes offered by the Peng You Taiji Quan Association embrace Chen Style (under Grandmaster Chen Zhenglei), Yang Style and Modern Style. Chen classes include 5, 18 & 74 (Old Frame 1) forms, Chen 47 Sword and Broadsword. Yang and Modern classes involve the 8, 16, 24 and 48 Forms, 32 & 42 Sword and Broadsword. There are also classes in Taiji Fan. All classes include Six Forms Taiji Qigong. Our purpose is to be an integral part of our community and to introduce as many people as possible to the benefits of Taiji for better health. The Association hosts many Taiji events and has done many demonstrations and workshops for a variety of community organizations such as the Arthritis Society, The Alzheimers Society and the Lakehead Association for Community Living. We value our relationship with Chickadee T’ai Chi of Ely, Minnesota and with taiji players in Duluth, Minnesota. We bring eminent international level teachers to Thunder Bay as often as possible: Master Wang Jianhua, Dr. Paul Lam, Master Eddie Wu, Master Zeng Nailiang, Master Wei Xianglian and Grandmaster Chen have all been here one or more times. 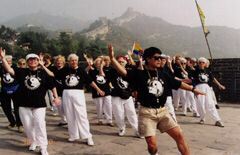 In September 1998 and November 1999, a delegation of over 80 people, many of them members of the Peng You Taiji Quan Association traveled to China – the oldest member was 82 years of age. During their trip, they experienced the richness of Chinese culture and demonstrated their Taiji on the Great Wall — a dream come true for many. The Peng You Taiji Quan Association maintains a strong commitment to our community and to the tradition of Taiji. We will continue to promote Taiji as a tool to achieve health, friendship and happiness for all. Our name, Peng You Taiji Quan Association, involves a pun on our teacher’s name. The first two words of our name are the chinese characters,”pengyou” which mean “friend”. It sounds just like the first two syllables of our teacher’s name – Peng You. So our name both reflects our Association motto, “Health, Friendship and Happiness” and it sounds like our founder’s name.